If you are looking for highly productive bass fishing all year round, you have to adventure out in Central Florida. 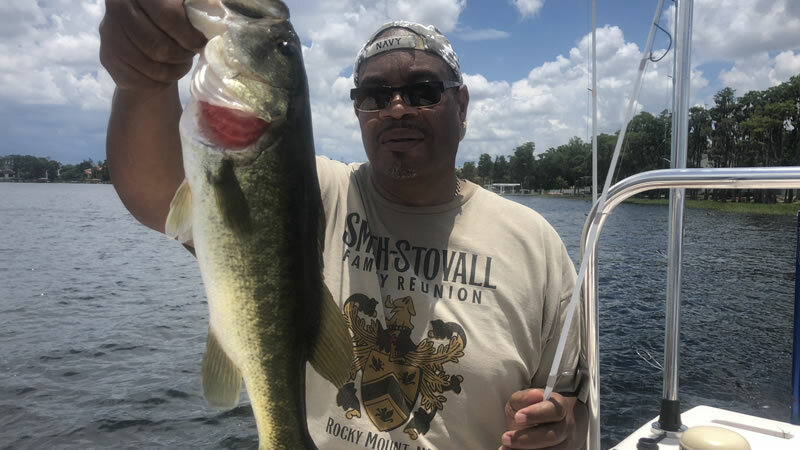 Orlando bass fishing can bring you great joy for your family and friends. Weekend fishing charters is the way to go whether you live locally or visiting Central Florida. Orlando, Florida is home to the Butler Chain of Lakes. It is one of the most breath-taking places to come fishing. The water is crystal clear, the bass grow large and the homes are stunning. When you explore this fishing destination, make sure you look up in the sky and trees as the birds and wildlife will amaze you. Just don’t forget you are also fishing, so don’t miss the bite! Captain Brent Nelson is the local expert on the Butler Chain of Lakes. Years of knowledge will lead you to have the best times fishing this lake. Richard and Mike adventured out with Captain Brent looking to catch some Florida largemouth bass. During these late summer months, storms and weather can always be a factor in fishing conditions. Despite stormy weather, Richard and Mike landed over 26 largemouth bass. The biggest bass weighed up to 4.5 pounds. Wild caught shiners were the most effective bait to catch the bass. If you focus on main lake vegetation, you will have the best success in landing a quality bass. Don’t count out these late summer months for producing a productive bite. You never know what will happen when coming out fishing here in Florida especially on the Butler Chain. Captain Brent is looking forward to another amazing time fishing with Richard and Mike. Just shortly after this awesome fishing trip, Captain Steve Niemoeller adventured out with Brian and his son Dylan. They were traveling from Mississippi in order to enjoy some time here in Florid on vacation. While visiting, they had to get out on the Butler Chain of Lakes. It was a great time to do so as the bite fired up during this fishing trip. The bass were schooling on Lake Butler. It is always exciting to fish a school of largemouth bass. You can throw top water baits on them and they will eat them up. Speed worms are also very successful. 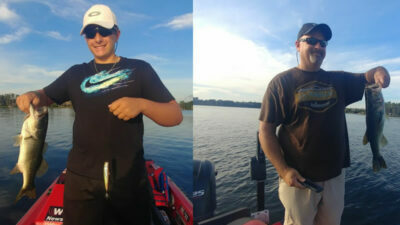 Brian and Dylan adventured out on a quick fishing trip with 12 fish in the boat! When you explore fishing in Florida, you can catch bass in multiple different ways. Get on the boat with a local expert and catch the bass throwing artificial baits or live bait. Captain Steve is looking forward to fishing with Brian and Dylan again in the future! They had a great time on the water. Don’t miss out on your Central Florida fishing adventure. Orlando is a great place to come visit and catch largemouth bass. We look forward to seeing you on the water next time!